The media has been proclaiming the current very strong El Niño to be potentially record-setting, with the sea surface temperature values tied with the 1997-98 very strong event. 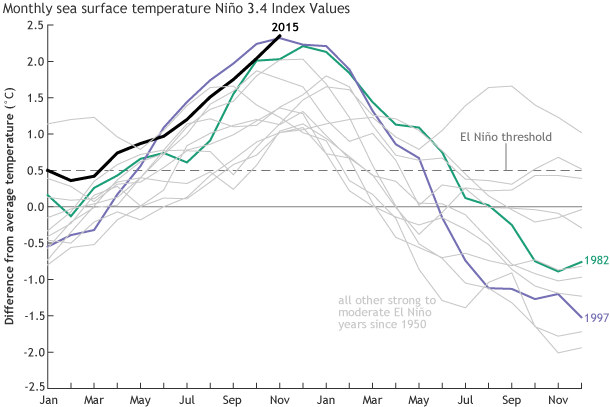 But as Emily Becker shows in the latest NOAA El Niño blog, it’s not quite that simple. Her blog post discusses the different methods for calculating the strength of an El Niño, including both atmospheric and oceanic parameters, and compares the 1997-1998 event to the current one. You can read the blog by clicking here. You’ll see that no matter what method you use, though, this is one of the strongest on record, with impacts that are being felt all over the world. 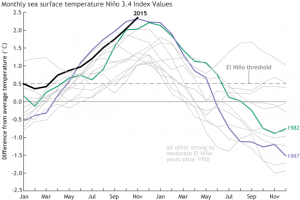 Posted in Climate and Ag in the news, El Nino and La Nina. Bookmark the permalink.